In July, I wrote about how Wing – one of Google X’s pet drone projects – “graduated” to become a full company under the Alphabet banner. Now, after months of testing its drone delivery service in Australia, the company is expanding to Europe with a trial planned in Finland next year. Based on its four separate trials – flying more than a total of 55,000 journeys – the drone company claimed that the total carbon footprint of Wing’s system is 22 times lower than traditional delivery services. Wing plans to start its Europe expansion in the Finnish capital city Helsinki. It has a form for the city’s residents to detail their views on the usefulness of drone delivery systems in day-to-day life. The form asks residents of the city to choose what items they would like Wing to deliver in under 10 minutes at their doorstep. The options include food, over-the-counter medication, and other emergency items. You can check out the complete form here. The company said that customers in the service area will be able to order a range of items through Wing’s delivery app, and have the products delivered by drone during its operating hours. The drones – which each weigh 5kg and have a wingspan of about 1 m – are capable of carrying packages as heavy as 1.5 kg, and can make a round trip of 20km before they need to be recharged. Our delivery drones can pick up a package from a business or home, fly to a designated destination, and gently lower the package to the ground in a precise location (like a yard or near a doorstep). Our Unmanned Traffic Management platform (UTM), plans and manages the drones’ flight path from take-off to landing, making sure they plan routes around each other, buildings, trees, and other obstacles. The company noted that 12 percent of Finland’s greenhouse gas emissions come from road transportation, and expressed confidence that replacing some of these vehicles with its drone delivery system could help reduce air pollution in the country. 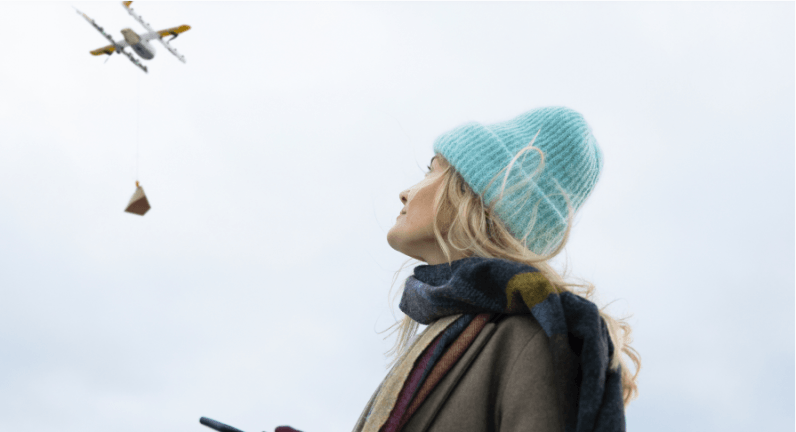 It will be interesting to see which companies and services will be the first adopters of Wing’s system, and if an expansion of Wing in Europe would lead to any changes in its existing drone navigation policies.